On 20 March 2014 prof Geo Quinot participated in a session dealing with international trends in procurement dispute resolution at the Procurement Week 2014 organised by the Institute for Competition and Procurement Studies. The annual Procurement Week of the ICPS, sponsored by the Welsh Government, took place from 17 to 21 March 2014 in Cardiff, Wales under the theme “A 2020 vision: Public Procurement Insights and Mega Trends”. Quinot presented the findings of comparative research on supplier remedies in African procurement systems. The other speakers in the session were Frank Brunetta, Procurement Ombudsman of Canada; Michael Bowsher, QC of Monckton Chambers, London and Alexandre Motta, Managing Director of the School of Administration in the Ministry of Finance of Brazil, who each shared their perspectives on dispute resolution in procurement contexts within their respective systems. In debate following the individual presentations questions were raised about the suitability of courts as primary vehicles for resolving disputes in public procurement. In particular the current approaches to reliance on ADR to resolve disputes in various stages of the procurement process were discussed. Participants noted that it was especially difficult to implement ADR approaches in respect of disputes during the adjudication stage of public procurement. Particular problems that commonly emerge in this context are the constitutional nature of these disputes making them not suitable to private dispute resolution processes as well as the necessity of including all bidders in a dispute resolution mechanism during the adjudication stage, which is challenging in most ADR mechanisms. Panel members noted that the statutory solution in Canada involving the Procurement Ombudsman seems a good approach. 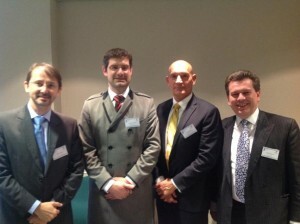 The Public Procurement Research Group at the University of Nottingham has announced the seventh in a series of successful international conferences, which will be attended by policy-makers, lawyers and practitioners from the main international organisations involved in procurement regulation, as well as world-leading professors and researchers. The conference will take place on 15-16 June 2015 at the East Midlands Conference Centre, University of Nottingham. It will include plenary sessions for all delegates and a series of parallel workshops and debates focusing on specific topics of interest to different delegates. The conference is sponsored by The Achilles Group and more information can be found on the conference website. The Department of Public Law at Stellenbosch University invites applications for a postdoctoral research fellowship in administrative law. Applicants must have attained a doctorate in law with a focus on South African administrative law and judicial review within the last five years and have experience in comparative research in administrative law. Work under the fellowship will be affiliated with activities of APPRRU. The Mail & Guardian reports that members of the Black Business Council (BBC) have renewed their calls for the approach to black economic empowerment in public procurement in South Africa, as implemented under the Preferential Procurement Policy Framework Act of 2000, to be revisited. In particular some members have called for the Act to be scrapped. One of the main concerns is that the Act only provides for price preferences and then only at a fairly small margin (20% for contracts under R1 million and 10% for contracts above). Members argue that this measure is insufficient to promote true empowerment through procurement. Dr Sope Williams-Elegbe, deputy director of APPRRU, presenting a paper on public procurement law reform in Africa at the Public Procurement Global Revolutions VI conference. 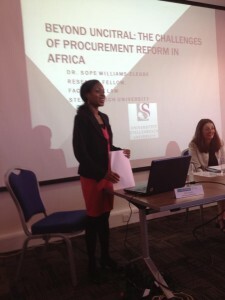 Three APPRRU researchers, Sope Williams-Elegbe, Ama Eyo and Geo Quinot, participated in the Public Procurement Global Revolutions VI conference, held at the University of Nottingham in the UK from 24 to 25 June 2013. The conference brought together researchers, policy-makers and practitioners from across the world to deliberate on current issues in public procurement regulation. The APPRRU researchers brought an African perspective to the discussions. APPRRU was also one of the collaborators in organising the conference. Mister Speaker, last year I said to this House that we will continually endeavour to increase the value which government receives for the money it spends. Let me be frank. This is a difficult task with too many points of resistance! However, we have registered some progress. In the present system, procurement transactions take place at too many localities and the contracts are short term. Consequently there are hundreds of thousands of transactions from a multitude of centres. There is very little visibility of all these transactions. While our ablest civil servants have had great difficulty in optimising procurement, it has yielded rich pickings for those who seek to exploit it. There are also too many people who have a stake in keeping the system the way it is. Our solutions, hitherto, have not matched the size and complexity of the challenge. As much as I want, I cannot simply wave a magic wand to make these problems disappear. This is going to take a special effort from all of us in Government, assisted by people in business and broader society. And it will take time. But we are determined to make progress. The process for setting up the Chief Procurement Office in the National Treasury has begun in earnest and I shall soon be able to announce the name of a Chief Procurement Officer. A project team seconded from state agencies and the private sector has identified four main streams of work, involving immediate remedial actions, improving the current system, standardising the procurement of critical items across all government and the long-term modernisation of the entire system. Among the first initiatives of the CPO will be to enhance the existing system of price referencing. This will set fair value prices for certain goods and services. Secondly, it will pilot procurement transformation programmes in the Departments of Health and Public Works, nationally and in the provinces. National Treasury is currently scrutinising 76 business entities with contracts worth R8.4 billion which we believe have infringed the procurement rules, while SARS is currently auditing more than 300 business entities and scrutinising another 700 entities. The value of these contracts is estimated at over R10 billion. So far 216 cases have been finalised resulting in assessments amounting to over R480 million being raised. 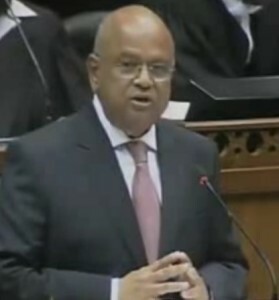 The Financial Intelligence Centre has referred over R6.5 billion for investigation linked to corrupt activities. These remarks confirm the impression created by the draft Treasury Regulations published late last year, which, in the part dealing with supply chain management, seem to suggest a move back to a more central controlled procurement approach. 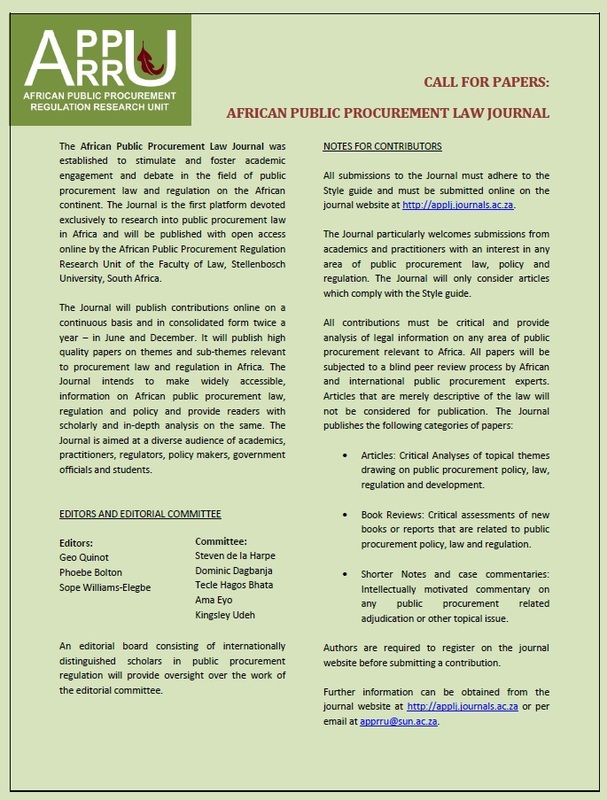 In January Cambridge University Press published Public Procurement Regulation in Africa edited by Prof Geo Quinot (Stellenbosch University) and Prof Sue Arrowsmith (University of Nottingham). The book aims to address the shortage of scholarship in the area of public procurement regulation on the African continent and to promote future research. In the book the law governing public procurement in a number of African systems is analysed and key themes relevant to all African states are looked at. Part I discusses the regulatory regimes of nine African systems using a common framework, providing both a focused view of these African systems and an accessible comparative perspective. In Part II, key regulatory issues in public procurement that are particularly relevant in the African context are assessed through a comparative approach. The chapters consider the influence of international regulatory regimes (particularly the UNCITRAL Model Law on procurement) on African systems and provide insights into the way public procurement regulation is approached in Africa. Apart from contributions by Quinot, the book also contains chapters written by Prof Phoebe Bolton and Dr Sope Williams-Elegbe, both of Stellenbosch University. The book is one of the first major outcomes of the work done by the African Public Procurement Regulation Research Unit, established at Stellenbosch University in 2012.